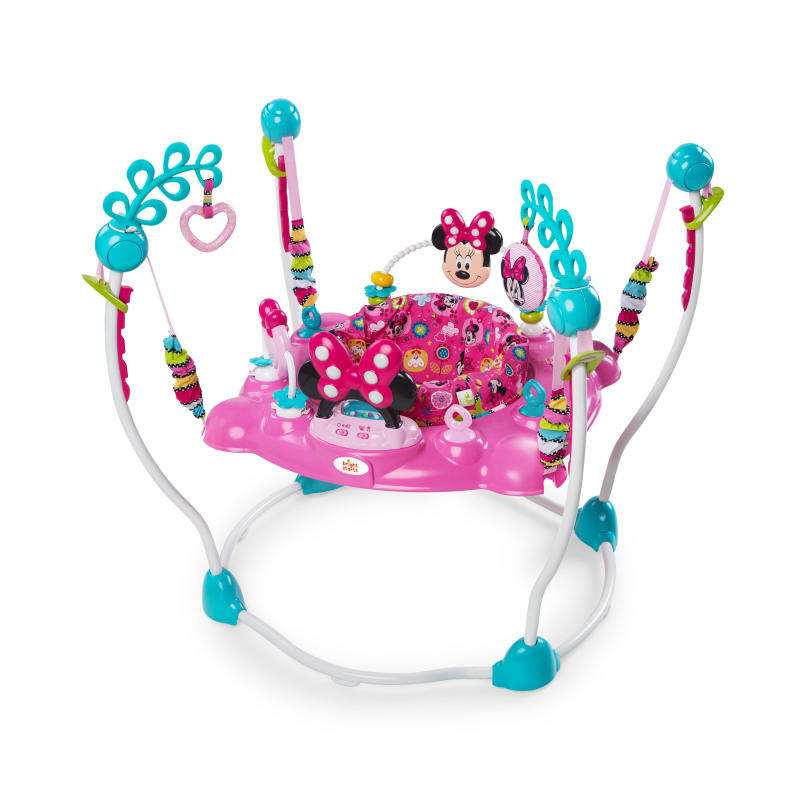 MINNIE MOUSE PeekABoo Activity Jumper is rated 4.8 out of 5 by 47. If there’s one thing we know about Minnie Mouse… it’s that she loves to play! Surprise your baby with peek-a-boo playtime fun that will have her laughing for hours. That sweet giggle is music to Minnie’s ears (and yours too). Twelve toys and activities create a magical world where your baby can jump and play with your favorite Disney Baby friend. The bouncy seat rotates around and around. Your little one will never get bored with laughter in all directions! And she can’t outgrow the giggles too soon – 4 adjustable positions make sure those tippy-toes can bounce from just the right height every time. Dimension (in) 31" x 27" x 34"
Rated 5 out of 5 by LDH2 from Multiple things in one This item combines our jumper and saucer and activity table in one item! That means we can downsize to just this! It has activities, music, and the little can bounce away! It was easy to put together and use! Rated 4 out of 5 by LaurelElaine from Adorable and fun for the little one My little one loves this jumper. She loves bouncing and is excited every time she sees Mini. The only downside is that she likes to be able to easily turn to face the opposite direction and doesn't get that with this bouncer. Rated 5 out of 5 by Pal2007 from Great product Great product. Its has colorful pieces that help to get babys attention. Rated 5 out of 5 by DanielleF from Fun Jumper for Playtime! This is a really great product that is incredibly easy to assemble. It took less than ten minutes to put together. I like the fact that my daughter can strengthen her leg muscles while she's jumping in the activity set. She loves to look at herself in the mirror and reach up and grab the toys hanging from the top of the set. I also have the option of hanging additional toys from the top, so she doesn't get bored playing with the same items. It's great for improving her gross motor skills. The only thing that's missing from the set is an additional sensory item on the tray that lights up and makes noise. Rated 5 out of 5 by Adamdrew from Too Cute! I just recently bought this adorable jumper for my niece and she is already building core leg muscles and melting hearts as she bounces, plays and laughs! The perfect gif for any princess!!! Many activities and safe seating makes Mommy's hands free for hours!!! Rated 5 out of 5 by garrets from I'm a guy, and I love seeing my daughter in this When I unpacked it, I thought "oh man, that's a lot of pink". My daughter vehemently disagreed. We had been borrowing a friends' bouncer until we had one for ourselves, and I thought she would miss it. No, she loved all of it. From the pink seating, to the giant Minnie head, to the Bow that played music, and the giant heart-shaped mirror. Safety-wise, I love it. The ring on the bottom is metal, as are the arms that hold the seat up. They don't give and feel like they can take a lot of weight. She has definitely bounced enough it that I think it's been stressed tested! This is great, and my daughter loved it!